Office Furniture Concepts (OFConcepts.com) offers a huge selection of office desks and office furniture that ranges from the cool and contemporary to the classic and elegant. 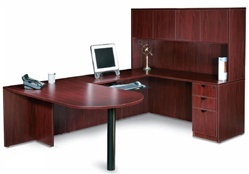 Top manufactures such as Global, Cherryman Industries and The Mayline Group also offer contemporary office desk styles. These companies not only carry multiple styles of office furniture, but every type of laminate future to meet your business needs. Our office furniture suppliers provide ergonomic office furniture that will fit any budget for a small start-up business to an established large corporation. If you are looking for a custom line without paying custom prices, Adaptabilities by Global is your best choice. Virtually any office layout is possible and delivered in 4 weeks. This line is available in both melamine and high pressure laminates, along with 13 woodgrain finishes and 6 solid colors. Many storage components are also available for most applications. Our Space Planning Professionals are available to help design maximize your space - call us today to get started for free! Looking for a good basic desk on a budget price? If so, then Genoa fits the bill. Stocked in both Dark Espresso and Quartered Mahogany this line features double pedestal desks, L desks and storage options. In stock and available for quick delivery! A superior laminate desk system will emphasize a clean and modern styling. Yet, beyond the good looks these laminated contemporary office desks and office furniture are superior and durable in their construction. They are designed to handle the wear and tear of everyday use in any office setting. Numerous features make our products the ideal and superior solution for all your office needs. We carry a wide variety of office furniture from meeting room furniture that come in tandem with ergonomic seating to office guest chairs, drafting chairs, computer desks and leather office furniture. 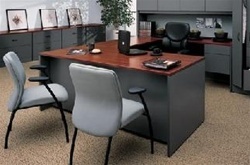 Ofconcepts carries affordable office furniture that’s a cut above outlets and department stores. Because our products are available in a wide range of components and sizes, we can deliver more. Because we’re always stocked in multiple laminate colors and office furniture selection, we can deliver faster. The Amber Collection of office furniture for sale at Ofconcepts is offered in multiple melamine finishes: Hard Rock Maple, Cherry and Mahogany. Our Mahogany melamine finishes allows you to have the deep, stoic and traditional executive furniture that coordinates well with executive desk chairs in the office. Our Hard Rock Maple melamine office furniture will integrate into any office setting with its versatile look. Lastly the traditional and timeless look of Cherry melamine finish of our Amber line of furniture can give your office the timeless look and mood that displays the right look for any office. With these tasteful finish options you can customize your office furniture to exhibit your tastes. Reveal your sense of style by contemporizing your office desk, modernizing your computer desk and fashionably finishing all your office furniture. The Amber line of furniture and the multiple finishes are stocked in four distribution centers throughout the country, and are available for quick Delivery. The Adaptabilities Modular offers exactly what’s tangled in its name, adaptability and flexibility in an impressive lineup of office furniture options. With over 370 components available in 324 color combinations, Adaptabilities modular line provides one of the most versatile, and customizable furniture lines for business office furniture. Rich laminate colors will coordinate easily with any office or decor and into any office setting. The adaptabilities modular series can perform well for a multitude of office functions. All surfaces of the modular furniture are constructed from exclusive high premium grade, high performance laminate and finished in 3mm thick matching edges which allows the series to provide durability as well as contemporary style. The Correlation Modular series is a big name line offering dependable contemporary office desks, computer desks and other office furniture that’s intended for the big time work area. The series is designed with solid 1 1/2" thick tops and 72" high cabinets and hutches that will accommodate larger computer monitors and hardware, which proves how functional this office furniture can make workstations. Correlation excels in executive settings and for supporting multiple management applications in private offices or serving as conference room furniture. The Correlation Modular also coordinates with Adaptabilities for the open office setting. Selecting this perfect package for your office will give you over 370 components in 289 exciting color combinations that range from traditional to contemporary. Our Adaptabilities series of office furniture is one of our most versatile modular series. The series is composed of well-coordinated, high quality contemporary office desk styles that are ideal for either the small multi desk office space or the large multiple department company. Great for any small start-up that needs a reasonably price companion for their executive leather office chairs or for that up and coming entrepreneur who needs everyone in the office to feel and work like executives. The Adaptabilities office desk system gives adaptability at an inflexible low price that works great for small orders as well as bulk orders. The Adaptabilities office desk system is also available with IN STOCK and ready for quick delivery. Correlation's curvilinear work surfaces help you work more comfortably and productively in your private space or office. The style, form and curves that gives the shape to the Correlation office desk series allow your eye to focus on the curves and beauty of the contemporary office desk while giving function to the curve that gives you a closer, more intimate space between you and those across the desk, whether it is a client or a potential new partner. The form and function of the curve gives desk space while reducing the footprint is a contemporary office desk for any office. Bend into contemporary style and dependable office furniture by deciding to correlate your office space with the Correlation line. The Genoa Series of office furnishings combines the value, durability and function of laminate furniture with the contemporary styling of top - over - end panel design. These office furniture schemes are simple and easy designs fit for the no non-sense office setting. This versatile offering of components and wide selection of laminate finish options is the perfect complement to any office environment that needs to have an efficient and productive office layout. The Genoa Series of affordable office furniture at Ofconcepts provides the extras desired in office furniture while maintaining an affordable price compared to other national office furniture outlets. Break through to contemporary office furniture without breaking the bank.